Increased emphasis in many school systems on formal testing to mark student achievement and hold teachers accountable has begun to heighten concern among many educational policy makers, assessment specialists, and classroom teachers over questions of access and fairness, particularly for learners from culturally different backgrounds and those with a history of academic struggles. This situation echoes that faced by the Russian psychologist L. S. Vygotsky nearly ninety years ago in his efforts to understand processes of development and meet the needs of all learners. His famous proposal of the Zone of Proximal Development (ZPD) holds that assessments must take account not only of abilities that have fully formed but also those that are still emerging. The diagnostic value of the ZPD lies in identifying the underlying source of learner difficulties as well as their future potential. Since Vygotsky's time, psychologists and educators have devised a range of practices for engaging with learners in ZPD activity that have come to be known as Dynamic Assessment (DA). In DA, assessors go beyond observations of independent performance and engage cooperatively with learners to both understand and support their development. This process is in full evidence in the papers in this collection, which offers a cross section of applications of DA with diverse populations, including special needs learners, immigrant and minority students, and second language learners. While these papers may be read as cutting-edge academic research, they also represent a commitment to going beyond manifest difficulties and failures to help individuals construct a more positive future. 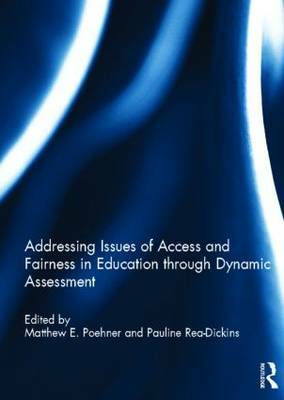 This book was originally published as a special issue of Assessment in Education: Principles, Policy & Practice.